Russians who joined the army together, or who met up at training camp, would often embark together. Six Russians from Brisbane, for instance -- the journalists Chirvin and Fedorovich, the engineer Romanovsky, the labourer Domilovsky, the former revolutionary turned cane-cutter Rosalieff, and the butcher Soolcovsky -- all ended up together in the 9th Battalion's 5th reinforcement, departing on the Kyarra on 16 April 1915, along with Korotcoff, a cane-cutter from Port Douglas. [...] William Kolesnikov, from Peretin in the Ukraine, had [...] horrific wounds [at Polygon Wood, 1917] -- as well as wounds to his left arm, his jaw and mandible were fractured and his tongue was shot away. 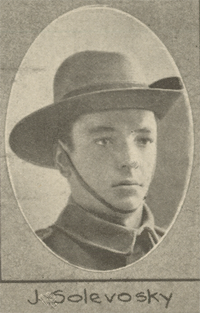 Yan Soolcovsky, a Gallipoli veteran who had been wounded previously at Mouquet Farm, now lost an arm at Polygon Wood. 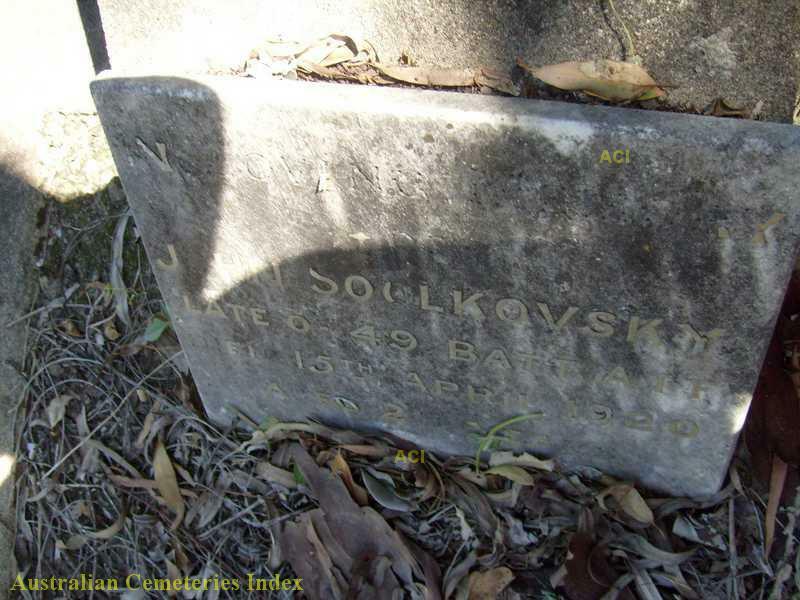 In 1920 he died in Brisbane with his fiancée at his side. Was there anybody to look after Kolesnikov? I could find no one.